This innovative design is crafted from beautiful 14 karat yellow gold. This contemporary setting features 12 round diamonds at approximately .50 carat TW. Each stone has been hand-selected for quality brilliance and sparkle. 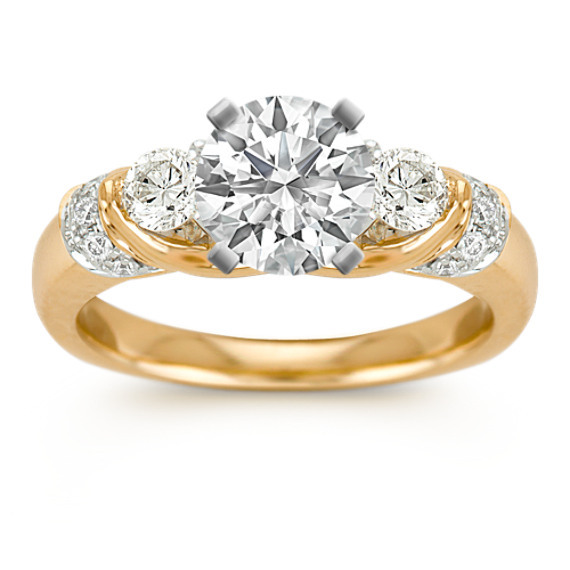 To personalize the look, add the center diamond of your choice. I wrote the other review. The website did not allow me edit any errors once published. I want to note that white gold is made by mixing pure gd with nickel to make it 14k white gold; as said, most all jewelers choose this method. I have not had any allergies to the yellow gold as I am not allergic to gold or copper. I do LOVE the ring and have every hope and desire that Shane co can solve my issue with the back holding water. The irritation I get comes from certain liquid, such as lake water, getting on my hand and under the ring. Because the hollow spaces (as shown in picture) do not air out naturally, it must be removed, cleaned and left to dry in the sun. Thank you for understanding one makes typing errors at times! I have had this ring for 5 years. I LOVE my husband and we have a blissful and wonderful marriage, this review is JUST about this ring. Firstly, it's beautiful. It's elegant, timeless, charming, everything I dreamed of in an engagement ring. My husband got me a VVS1 Shane classic stone for the center and I've never seen a ring more beautiful. The negative, every time I get it wet I have to take it off and let it dry. What you don't see in these pictures (and what you don't think of when your picking put a ring) is that there are triangle cut out spaces on the underside of the ring. You would think these were to allow the diamond to breath but the space on top is closed up. This means water gets trapped in the hollow place and does not have a top opening to air it out. My finger stays waterlogged. If I swim in a lake and lake water get in it, I have to clean it and let it air so I don't get an infection. I tired this ring in white gold first, but I have a nickel allergy. Shane makes white gold by mixing it with nickle (most ALL jewelers do the same!) so when my skin got water logged the nickle would really get at it and my whole hand broke out. I was able to swap for the yellow gold but no other changes. That was 5 years ago and while there are more allergic reactions, it's a very irritating ring. I highly recommend Shane find another way to make THIS ring because it's so elegant and lovely to see!!!! I also recommend that everyone choosing a ring be aware of how the ring is made and not just of its beauty!! When you see the pictures, be advised that I have a simple gold wedding band that Shane co attached to by engagement ring so they don't slide in opposite ways!! Also, I'd really love for Tom Shane to reach out to me and understand this situation through my eyes as this is the story I've had to share with everyone for 5 years...every time I have to take my ring off to let it air out and some odd happening makes it disappear for a while and I have to rally all my friends and family to help me pray it get found! Thankfully, it is found! !